AIRAID® revolutionized the automotive aftermarket in 2002 with the introduction of our SYNTHAFLOW composite material. This material, which AIRAID pioneered after exhaustive research and development, remains the standard by which other filters are judged today. Every AIRAID Premium Filter is built using a combination of precision equipment and the finest materials available along with the attention to detail that only fine hand craftsmanship can provide. 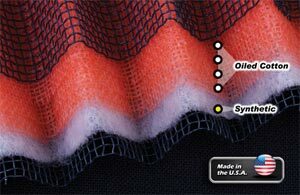 We start with multiple layers of cotton gauze and then add our own proprietary blend of synthetic materials, resulting in a superior filtration system that allows plenty of free-flowing air for maximum performance, but not at the cost of letting contaminants through. In fact, all AIRAID Premium Filters are proven to trap the smallest dirt particles that get past the common cotton-gauze "performance" filters typically found on the market. We are so confident in our filters that we back each and every one of them with a "No Hassle" Warranty; if you ever have a problem with an AIRAID filter, we'll take care of it, no questions asked!